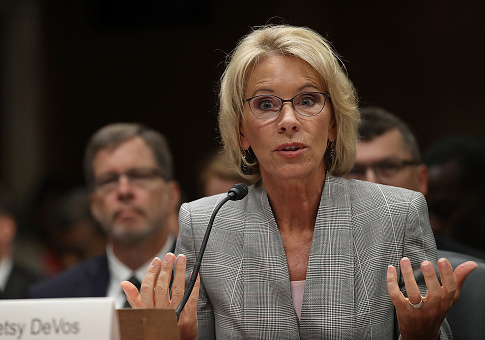 A yacht belonging to the family of Education Secretary Betsy DeVos was vandalized last weekend in Huron, Ohio, causing thousands of dollars in damage. The captain of the $40 million boat, known as the SeaQuest, reported to police at about 6 a.m. Sunday to say it had been untied and set adrift, which led to $5,000-$10,000 in damage, the Toledo Blade reports. The boat struck the dock before the crew could get control of it, and the collision caused the damage, according to the police report. Officers said they are searching for surveillance video to try to ascertain who unmoored the boat. It is unclear what motivated the act. The SeaQuest, worth a reported $40 million, is one of several boats the DeVoses own. Betsy DeVos is one of the wealthiest members of President Donald Trump’s cabinet, leading many of her opponents to speak of her wealth in negative terms and accuse her of being unqualified. The yacht is registered to the family’s company RDV International Marine. The company shares a location with RDV Corporation, one of the private investment and financial management firms that manages the family's wealth. Officials with RDV Corporation and the City of Huron did not reach the Blade with comment. DeVos has received vociferous opposition from Democrats and teachers' unions since Trump nominated her to her position atop the Department of Education. This entry was posted in Culture and tagged Betsy DeVos. Bookmark the permalink.